Be the first to share your favorite memory, photo or story of Bendukaosi. This memorial page is dedicated for family, friends and future generations to celebrate the life of their loved one. 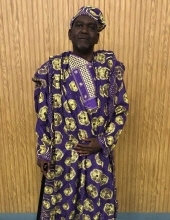 Bendukaosi “Bendu” E. Nnoli, 64, of Brockton, passed away on Monday, January 28, 2019 at the Massachusetts General Hospital in Boston after a period of failing health. He was the husband of Mary E. (Love) Nnoli. Bendukaosi Esobugno Nnoli was born on July 21, 1954 in Enugu, Nigeria. He was the youngest child of Marcellinus Chukwuemeka Esogbuna Nnoli and Linda Agunyenwa Nnoli (nee Ifediora), of Oba, Anambra State, both born in 1912 in Oba, Nigeria. He was the youngest sibling of Nduagbo Esogbuna Nnoli and the late Nwabisi Esogbuna (nee Nnoli). He was the step brother of Anuli Obi, Chiemezir Obi, and Kodilinye Nnoli. Bendu attended All Saints school in Enugu, secondary school at Merchants of Lights in Oba, and Government College Afikpo. He worked briefly in the Department of Post & Telegraph before proceeding to the United States in 1978 for additional studies. In 1983, he received his bachelor’s degree in business administration from Northeastern University in Boston, Massachusetts. From 1987 to 2003 he worked as an accountant for the Commonwealth of Massachusetts. In 1988, Bendu met and married Mary (Love) Nnoli and they were blessed with three beautiful children: Agunyenwa Ifunanya Esobugna, Chiemeka Ifunanya Esobugna, and Nduabugno Ifunanya Esobugna Nnoli. Between 2003-2006 he owned and with the support of his family, operated a 711 franchise in Taunton, Massachusetts. Bendu’s strong analytical, mathematical, problem solving skills, persistence, attention to detail, and sharp memory are the attributes he shared and left with us. He is affectionately called Uncle Ben by all of the family and Olekesi by his closest friends. In spite of his health challenges, he remained steadfast and unwavering in his faith and dedication to God. Calling hours will be held in the New England Baptist Church, 560 North Main Street, West Bridgewater on Friday, February 8th from 2:00PM-5:00PM. Funeral Services will begin at 5:30PM in the church. Private interment will be held in the Pine Hill Cemetery, West Bridgewater. "Email Address" would like to share the life celebration of Bendukaosi E. Nnoli. Click on the "link" to go to share a favorite memory or leave a condolence message for the family.